While navigating off the Somali coast, Combined Task Force (CTF) 150 flagship, French Ship (FS) Var, linked up with two Spanish ships from the European Union Naval Force (EUNAVFOR) Somalia otherwise known as Operation Atalanta, who were operating in the area. 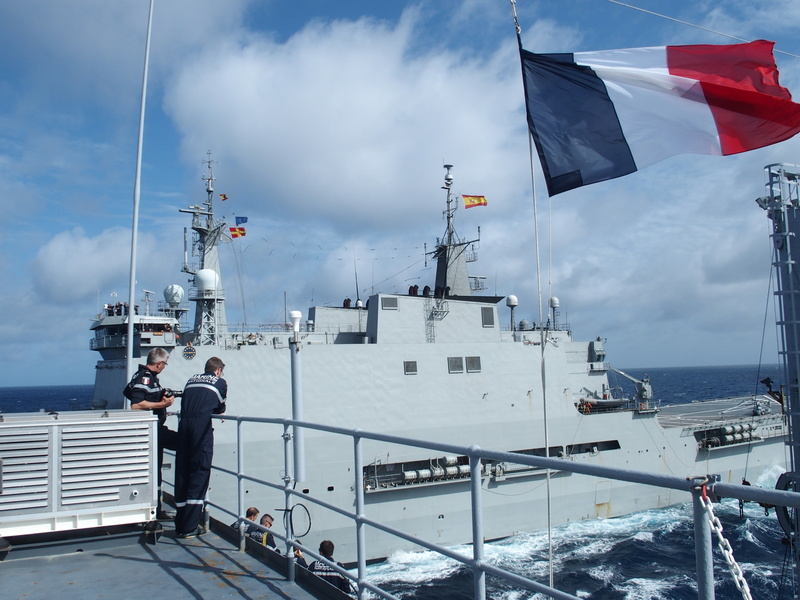 Spanish Ship Galicia and French ship Var side by side during replenishment at sea in the Indian Ocean. 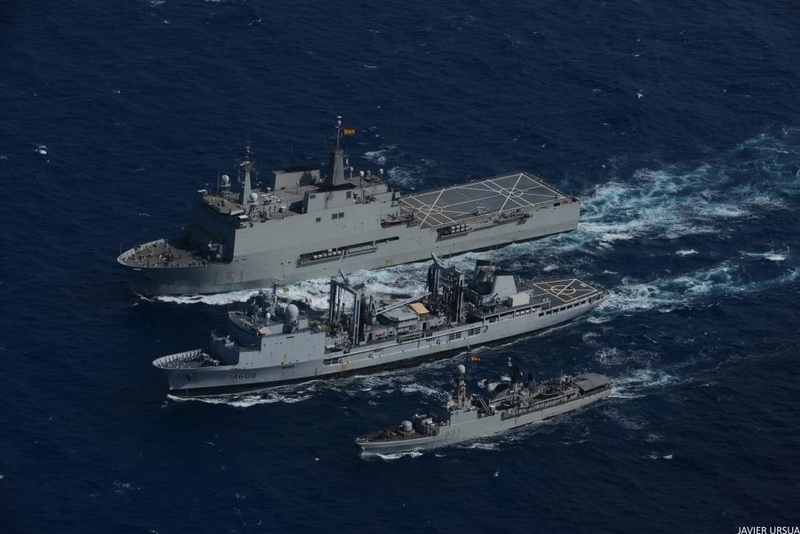 Under the direction of EUNAVFOR Spanish amphibious ship Galicia and Spanish corvette Infanta Cristina are involved in Counter-Piracy and maintain maritime security patrols throughout the region. CTF-150 is one of three naval task forces operated by Combined Maritime Forces (CMF), which is a multinational naval partnership of 30 nations. 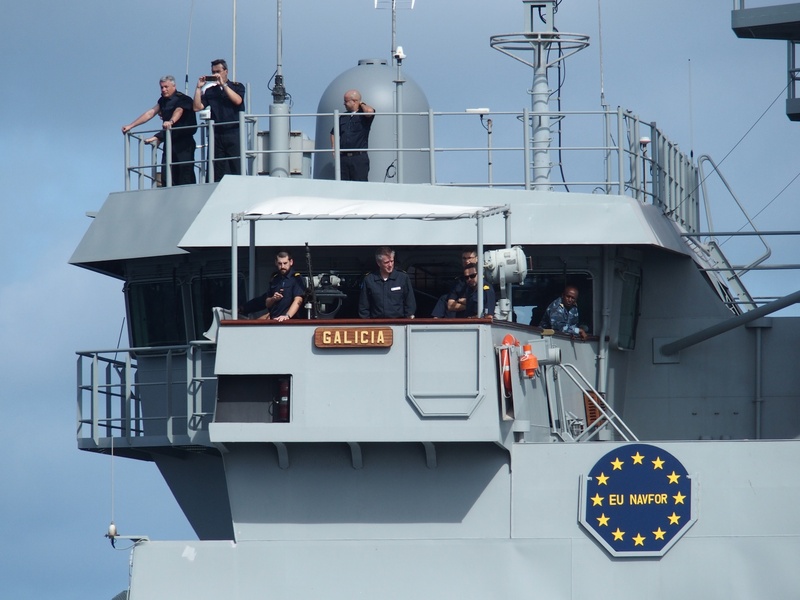 CTF-150 mandate is about promoting the conditions for security and stability in the maritime environment by countering terrorist acts and related illegal activities, which terrorists use to fund their operations or conceal their movements. CTF-150‘s Area of Operation spans over two million square miles and includes some of the world’s most important and busiest shipping lanes, covering the Red Sea, Gulf of Aden, Gulf of Oman and Western Indian Ocean. Galicia Sea King helicopter conducting airlifting manoeuvers on FS Var’s deck. Early morning on 27th May saw the two Spanish vessels presenting themselves for approach manoeuvers alongside FS Var. During this meeting at sea, the French supply ship conducted a double replenishment at sea (RAS). These manoeuvers are particularly complex, as the three ships have different displacement manoeuvrability and coordination of movement is critical to the RAS success. To ensure a constant distance between the ships requires complete coordination between the ship’s helmsmen and crew on deck. 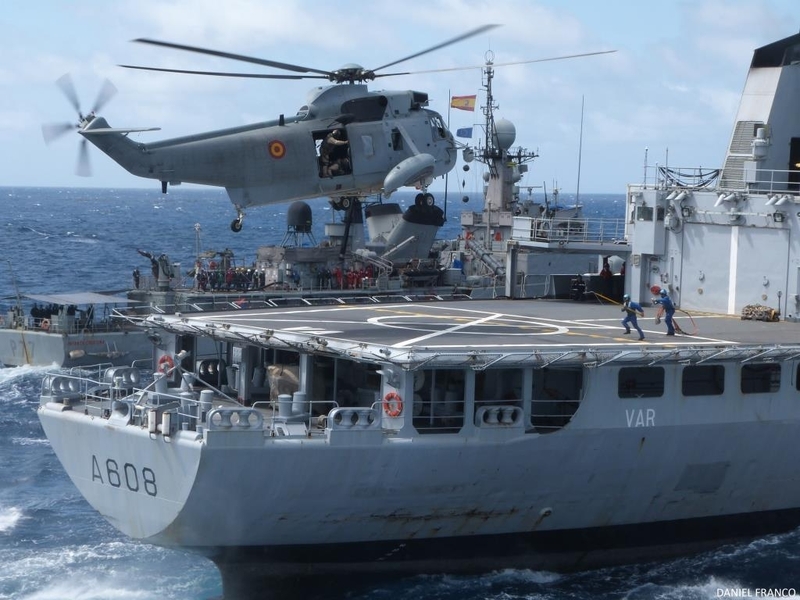 The encounter of three Naval Warfare Ships at sea in this evolution was an ideal time to practice Ship Control Approaches and Vertical Onboard Delivery (VOD) between the Var and the Spanish Helicopter SH-3D C/S. Crew members from the flagship, Spanish ship Galicia, monitoring replenishment at sea from the vessel’s bridge. Following successful completion of replenishment and in accordance with tradition, Var presented her Spanish counterparts with a signature tune : “Aserejé” (The Ketchup Song), 2002 hit song recorded by Spanish pop group Las Ketchup. By way of thanks, Infanta Cristina also provided Var crew with local Spanish specialties. Then, the different units from both CTF-150 and TF 465 broke away to keep on with their respective Maritime Security Operations. This RAS is part of the maritime cooperation between different international Task Forces deployed to ensure regional maritime security inside the Indian Ocean against threats such as piracy attacks or international terrorism and related illicit activities (CTF-150). These demanding interactions provided further proof of the enhanced skills and related capabilities shared by allied navies and their high level of interoperability.